Do Your Cabinets Need A New Look? Give your kitchen a whole new look with cabinet refinishing. Skip the stress and expenses that come with starting an entire remodel project. 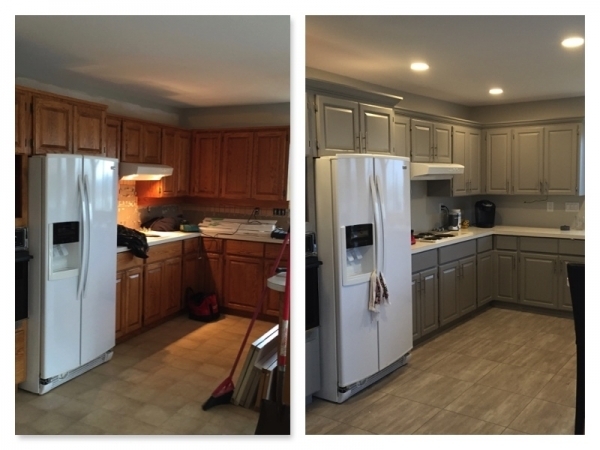 By simply changing cabinet colors, you’ll get the same great experience that follows a makeover. Wooden cabinets usually stay in good shape, despite the paint or stain wearing out over time. Freshening them up is easy to do and will not take long. Here is how experts with Glamour Painting recommend you get the job done. Cover the floor and any surfaces you don’t want paint dripping on with newspaper or old sheets. If possible, remove the handles and hinges rather than trying to tape them off or brush around them. Get rid of any chips or loose pieces. Sand the cabinets to ensure a smooth surface. Put a primer on the cabinets. Solvent-based types are good for stain or glossy oil-paint surfaces. Alternatively, an oil-based one can work both for covering the stain and acting as a bonding agent. Water-based primers are eco-friendly and easy to clean, but they may not give you the best coverage. Use a special lint-free roller brush once you’re ready to add the paint. You may need to use a smaller brush to ensure you get the hard-to-reach spaces. Another option is to use a spray machine for the paint. It is a faster option than a brush, but it can get messy if you are not a cabinet refinishing professional. Install brand new handles and hinges once the paint dries. Choose unique shapes and colours that complement your updated paint colour and style. For an even more complete kitchen enhancement, add new lights and floor tiles. Glamour Painting is committed to helping you tackle painting or staining cabinets in Vancouver. Call us today for a free quote.